Sunday September 2nd 1900 I got my work done up and such a nice dinner ready by noon. Mother Ott & Legrand were down. The Stevens girls came in the afternoon and they stayed till after supper. A very pleasant day. 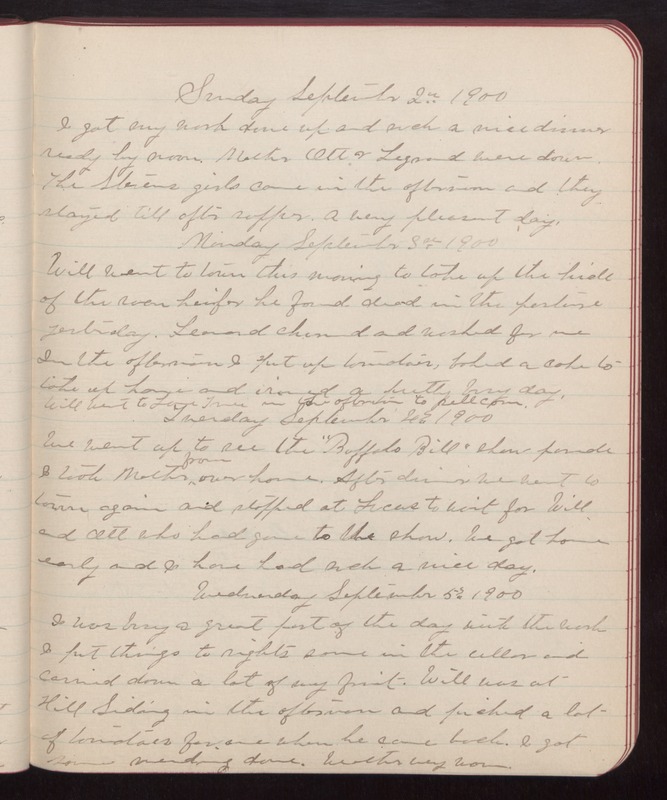 Monday September 3rd 1900 Will went to town this morning to take up the hide of the roan heifer he found dead in the pasture yesterday. Leonard churned and washed for me In the afternoon I put up tomatoes, baked a cake to take up home and ironed A pretty busy day. Will went to Lone Tree in the afternoon to sell corn. Tuesday September 4th 1900 We went up to see the "Buffalo Bill" show parade I took Mother from over home. After dinner we went to town again and stopped at Lucas to wait for Will and Ott who had gone to the show. We got home early and I have had such a nice day. Wednesday September 5th 1900 I was busy a great part of the day with the work I put things to rights some in the cellar and carried down a lot of my fruit. Will was at Hill Siding in the afternoon and picked a lot of tomatoes for me when he came back. I got some mending done. Weather very warm.